A charming hotel in an 18th century property, Hotel D'Angleterre features comfortably modern and well decorated rooms. A "creperie" – serving French-style pancakes – and an English pub offers places to relax, with family or friends. 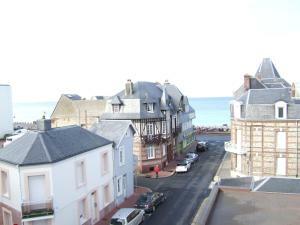 The hotel is located 50 meters from the beach at Fecamp - a beautiful seaside town and historical, and artistic center. Nearby, the famous cliffs of Etretat and the fishing village of Yport. When would you like to stay at Hotel D'Angleterre ? This room features free Wi-Fi access and a private bathroom. This room features free Wi-Fi access and a private bathroom with bathtub. This suite features free Wi-Fi access and a private bathroom with bathtub. Please note that only dogs are accepted at the property. Please note that it is not allowed to leave the pets alone in the accommodation. Each day we'll check prices and send you an email for your selected dates at Hotel D'Angleterre. If you don't have specific dates but would like to check prices for say next weekend or say next month we can check the price too. Click to write a review and share your experience of Hotel D'Angleterre with other travellers.